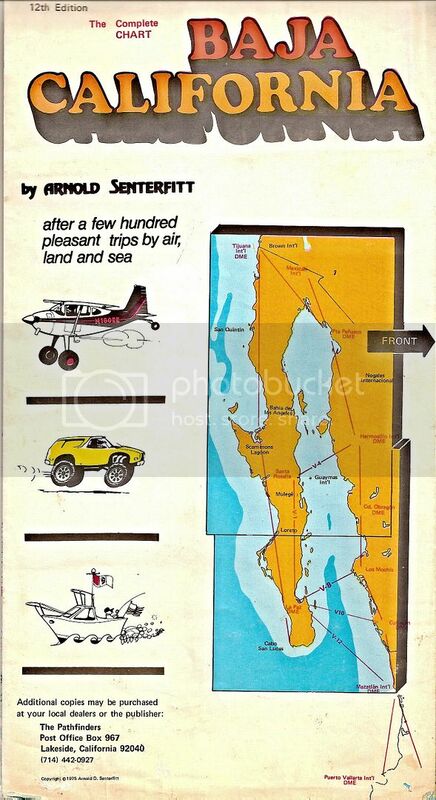 Arnold Senterfitt was the author of Airports of Baja California during the 1960's, 1970's and 1980's. 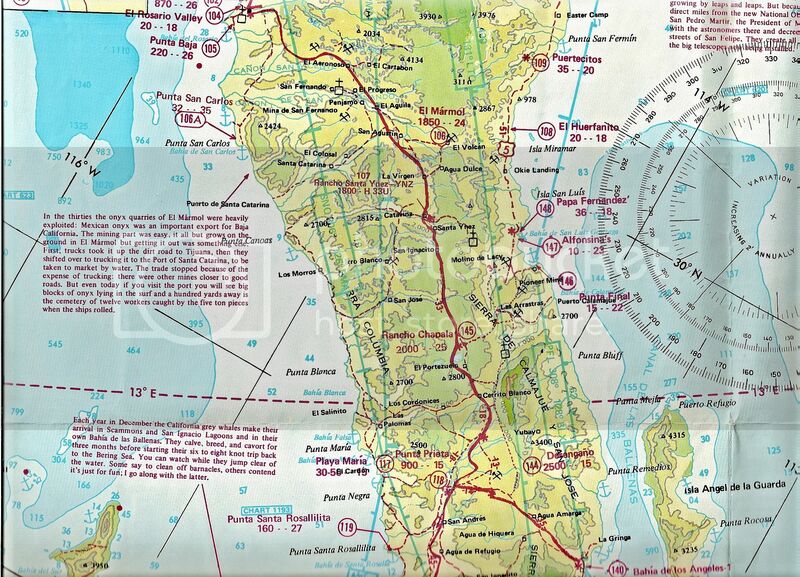 He produced some colorful, topo maps for pilots but added more road and sea details for a larger client base. 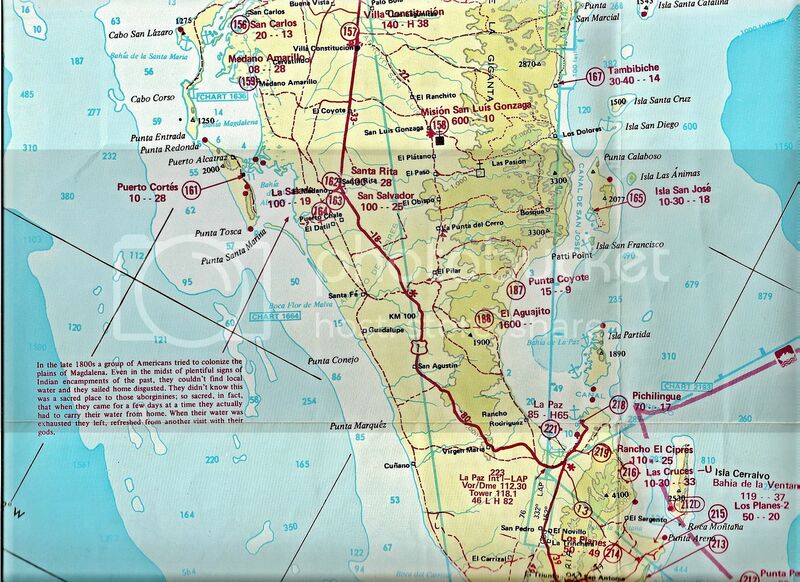 Here is his 1975 edition folding map with the recently completed Baja Highway (Mex. 1) added in. Not a bad job with only a hiccup/ error just north of the L.A. Bay junction and just south of Bahia Concepcion, west from Puerto Escondido and around Santiago/Miraflores. 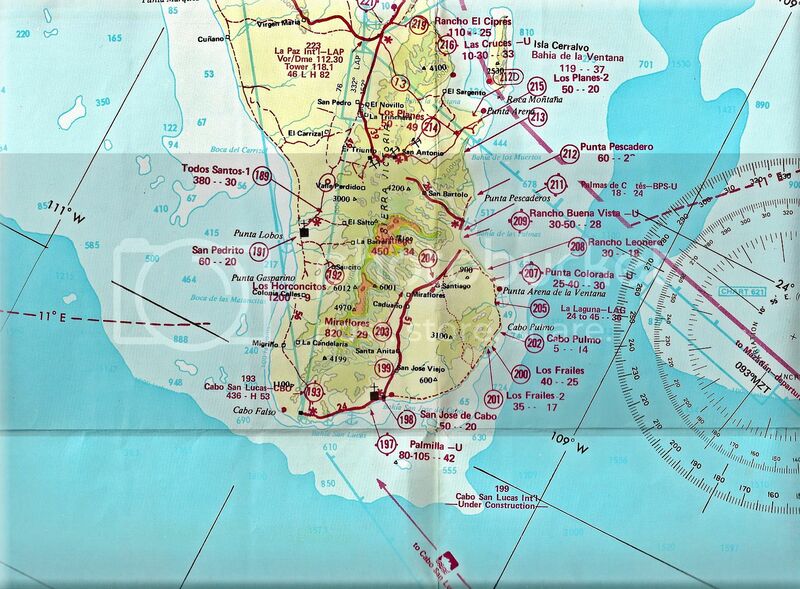 The map is shown here for historic interest, as it is 38 years old, do not use for navigation! The airports (air strips) are the red numbers in circles which match the airport number in his book. the first number below the airport name is the elevation in feet and the second number is the runway length in hundreds of feet. 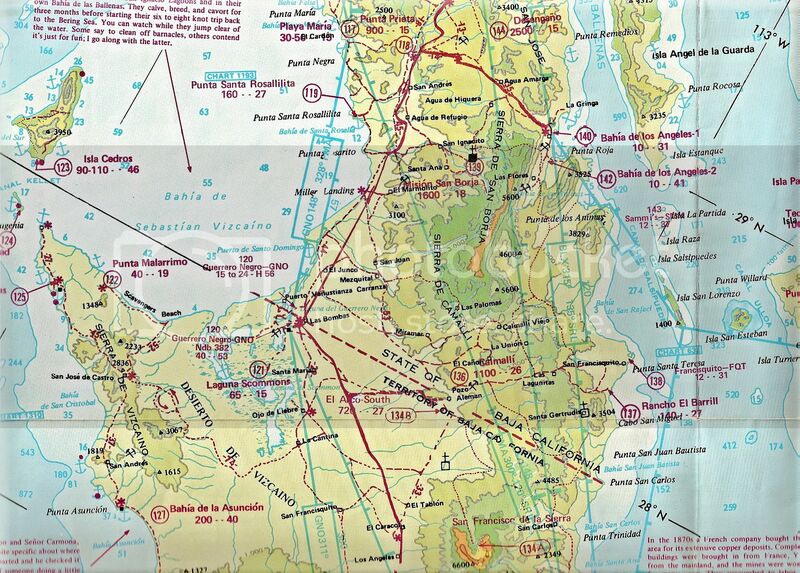 As you can see, Baja once had over 200 open runways for pilots to travel throughout Baja. Most of these runways have been ditched by the military as part of the drug trafficking controls. If anyone would like a zoom-in of any area on this map, just ask! 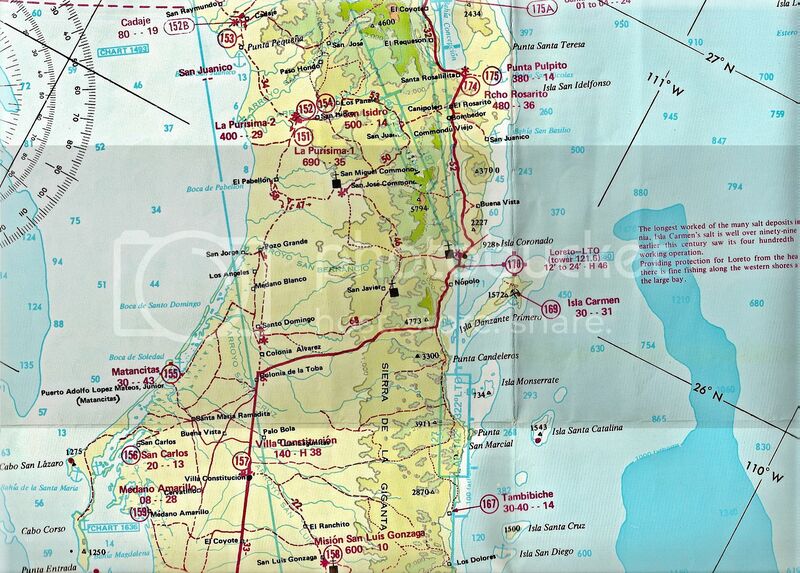 The mainland side of the gulf is also on the map. 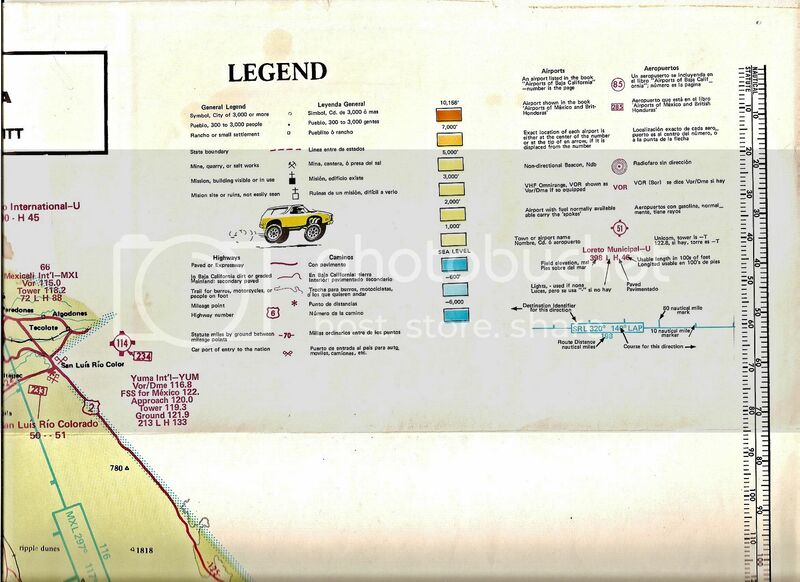 Cartoonist and Baja racer/ pilot Dave Deal drew the cartoon figures for Arnold... both lived in San Diego County. nice map. I never get tired of looking where I want to see next. Thanks. Thanks... and these 'old' maps give us a look back in time! Did you ever meet him David? I had the good fortune to run into him (not literally) at Meling once. He was quite a guy, his influence on flying in Baja is inestimable.. I still have a copy of that book in the hangar. I used it to fly into most of the Baja dirt strips on the east coast of Baja starting in about 1979 in my 1957 Cessna 182. I still do that but with the Baja Bush Pilots stuff now but in a Bonanza. I miss that old 182 but the Bonanza is 50 knots faster but won't carry stuff like that old bird did--if you loaded it with cement bags, beer, food, booze, people and sometimes anvils it would fly just fine! I never met Arnold. He lived in Vista. His book was magic to us back then when flying into and out of Baja was a real adventure. We built a place at Alfonsina's in 1979-80 and flew in and out from San Diego every weekend. There was no way to get a weather report there then and we didn't have the gas in our old C-182 to fly to TJ and the divert to Mexicali if TJ was socked in. So we had to climb high (about 8500 feet) and get somebody coming south on the radio with the WX. Later we bought gas from Francisco and Ysenia from a barrel through a chamois at Catavinia so we had the range to be safe. We flew water in five gallon jugs down to Alfy's beach from Rancho Santa Ynez because Afly had no fresh water. It was an 8 minute flight up there from our beach but a 5.5 hour drive! The water at Rancho Santa Ynez came out of a well with a paint bucket on a rope--Good Water! The girls tried using our 20 gallons or so of that water for washing hair etc. We told them that they could get a "permanent wave" by dumping salt water over their heads and then going for a fast ride in the dune buggy :-). We found that you could take a bath in the ocean and then put hair conditioner on yourself and that would keep the salt off! We heard that Concha, who cooked in Alfy's cantina, and her kids had never had ice cream. So we got an old ice cream freezer and flew the makin's (salt, cream, sugar, ice etc) in there to make the ice cream. Both of Concha's cute little kids got sick from eating too much. That kind of story was common back then when flying and building in Baja was a real adventure! Arnold started the Baja Bush Pilots and it is still going. Sat. before last we had a gathering at Serenidad of Baja Bush Pilots (now called Bush Pilots International). We had 21 airplanes at the Pig Roast and lots of good fishing (in the fog). 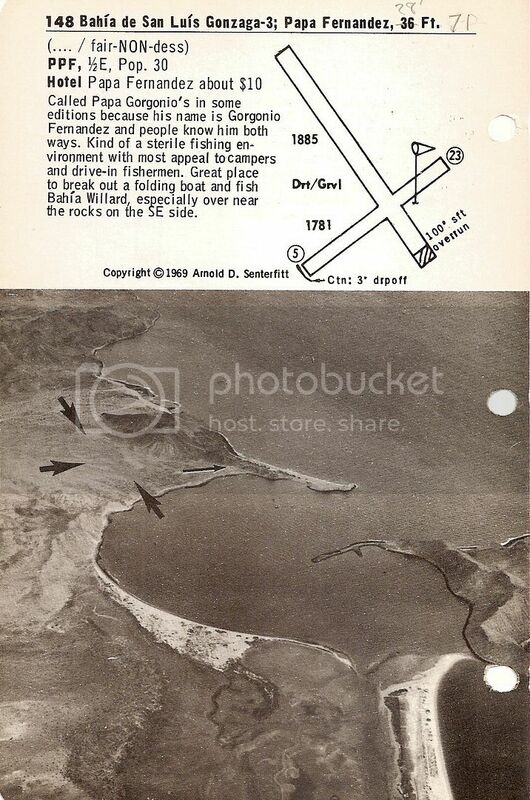 Arnold would map each airstrip and measure it himself flying his Cessna 195. A real pioneer. Great map and great stories. Thanks for sharing. Great stories guys! Ken, no I never met Arnold, but for a while he kept his plane at Lake Wohlford Resort's airstrip hangers, and I lived at Lake Wohlford (above Escondido) from 1970-1994... A friend I flew with a few with wasn't sure about landing on the aircraft carrier style airport, so we walked up to it from my home, with my (irrigation) measuring wheel... As we went past one of the hangers, a pilot yelled out: "Arnold says it it 1,500 feet"... and he was right... I knew who 'Arnold' was, afterall! LOL (That was in 1989). Any more pilots out there with an Arnold Senterfitt or Baja dirt field story? I have his 1967 map, too... I think, if I can find it! Arnold's trusty 195 eventually became problematic as an efficient machine for his needs - he went to a 180 i think, still a tail dragger of course - my partner has a '57 model. those 195 with the Jacobs 275 hp radials drank a lot of oil, i mean by the gallons! And also the gas it drank was voluminous too. yes, that was fun again! I miss Baja flying. But sadly there might not be much in the cards [for me anyway] the way the Mexican government is making problematic rules. Thanks, David. 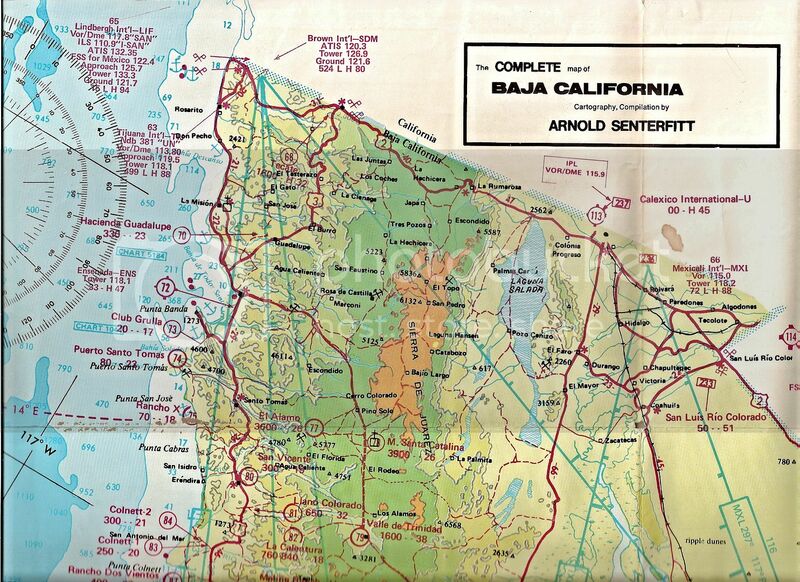 I used that map a lot and still use Arnold's book when flying to Baja. Hasn't changed much! Is it okay I still call you "TW"? 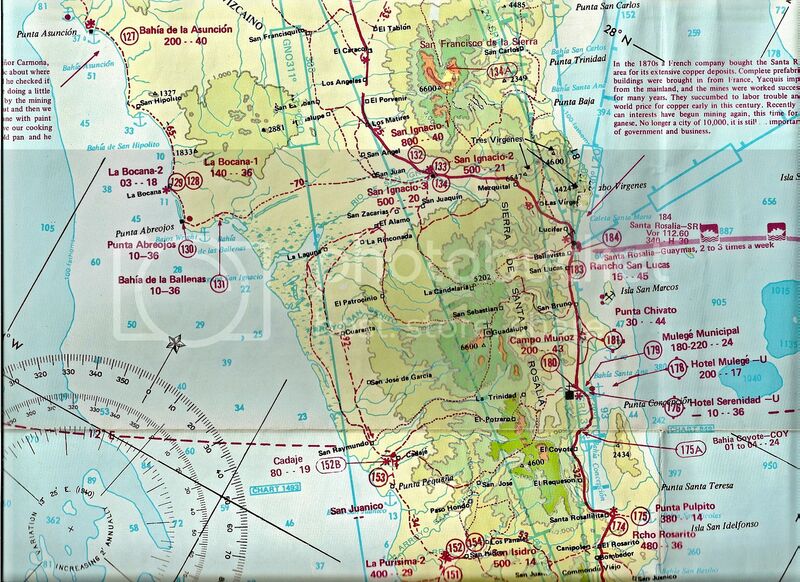 Funny, but since I bought this map when it was issued, I don't think of it as an "old map"... but that was almost 40 freakin' years ago... OMG! 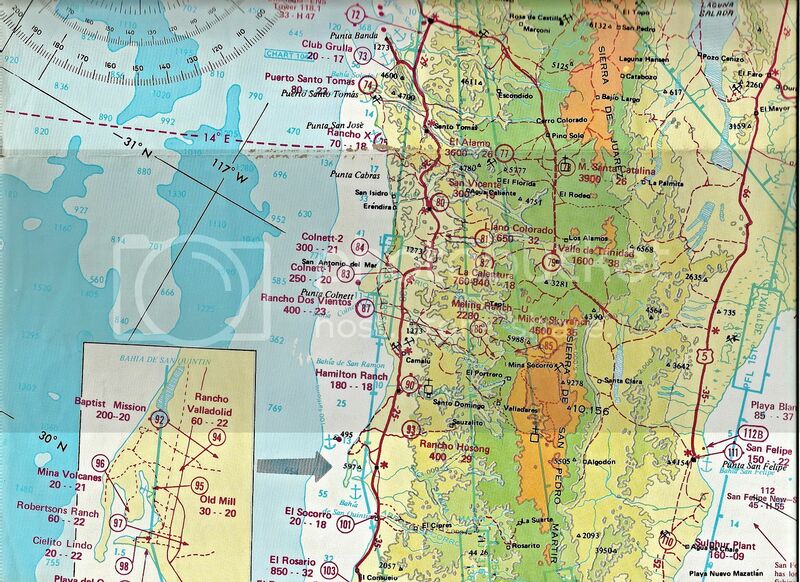 Are there 16-18 year old kids out there today who collect Baja books and maps??? We spend half or more of our life collecting... then it is time to get rid of it! Somehow, I think I shouldn't... besides my son says he wants it (that's a good sign, right?). You can call me anything except Johnson or late for dinner. Used his book on many a flight back in the day. Had one flight to Papa's where a friend got word to me that he hit a rock landing his 182 (182 TRUCK, if it went in the door and the door closed it flew down there. Have seen the tail dragging within 2 or 3 inches of the ground on taxi out with him, weight and balance????) and broke a wheel so I loaded up a retractable Cherokee with tools and stuff and flew to his rescue. Bought the Commandante in Mexicali "lunch" when I went through. Had the guys partner with me and on landing at Papa's of course we were going to use ALL of the runway after the road ruts but he didn't know and said after we stopped that he wished HE had brakes on his side so he could have pushed harder on the brakes. A lot of folks today didn't know Papa Fernandez had a runway... but in the 60's and 70's, that's how a lot of his business arrived! Yes, the road crossed the runway, and the ruts from trucks were not plane friendly! Bonanza Bucko - you are a hoot!! great stuff. pls do more. 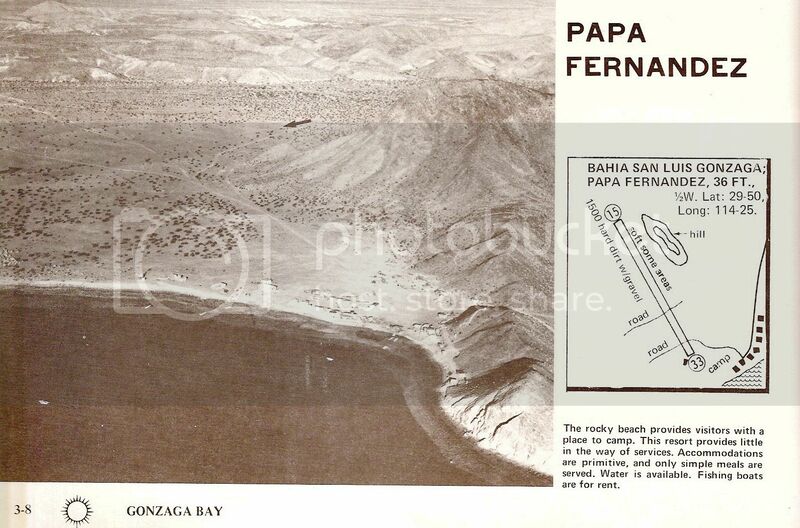 Baja once had over 100 airports! I have Senterfitt's book, but had not seen the map before. Thanks for posting it (three years ago). I was looking at the current WAC CH-22 chart the other day, remarking how relatively few airports there are on it. It's kind of amazing that there were four airports in Mulege. About the same number around San Quintin. Many of the old airports are gone. I looked at Google Maps for airports 160 and 161 around Santa Rita. Judging by Google, they appear to be gone. I think the airport at San Lucas Cove is gone, too. However, the area around Mexicali and San Luis Colorado has about 30 airports on the Los Angeles Sectional Chart [I incorrectly said it was the WAC chart first], more than Senterfitt!